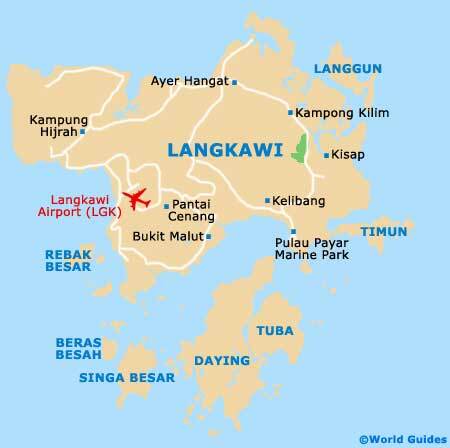 Most tourists come to Langkawi for three things - the weather, the beaches and the shopping attractions. It is sunny most of the time and there are numerous beautiful Langkawi beaches to check out. The island also has many other tourist attractions, including waterfalls, mountains, villages and various family friendly theme parks. Pantai Cenang is the top beach and has most of the attractions, while the main town is touristy Kuah in the south. Two very popular kiddie attractions are the Crocodile Adventureland and the Underwater World, with the Oriental Village appealing to all. For a taste of Malay nature at its best, pay a visit to the Durian Perangin Waterfalls, which are just a short distance from Kuah. Kuah is in the south-east and functions as the main town on Langkawi. It is the gateway and has the best amenities and shopping by far, plus is also the best bet for launching off to other islands in the chain. Kuah is not all that pretty, however, but is a good bet during festivals. Plenty of attractions are based both in and around Kuah, such as the Lagenda Dalam Taman theme park and its colourful lakeside statues, the Masjid Al-Hana Mosque and its giant onion-shaped domes, and Chogm Park, which in 1989, played host to an important meeting of Commonwealth leaders. Also in this area is the Gunung Raya Golf Resort, the Kedah Marble Quarry and the Langkawi Bird Paradise, where many exotic birds are on show. Telaga Tujuh, or Seven Wells as it is often referred to, is situated near to the Gunung Mat Cincang mountain in the north-west. This waterfall is named after the seven natural pools along its path and offers a pleasant alternative to the salty ocean. You can dip in the pools and take in a fine view from the bottom, and even take a slide along a naturally smooth stretch of stone between the pools. Trekking can be done here, too, although toilet facilities leave a lot to be desired. Also relatively close by is the Oriental Village and the cable car ride. Covering around 20 acres / 8 hectares, this large crocodile farm has become one of the top attractions on Pulau Langkawi and sees large visitor numbers each year. Situated at Datai Bay, just over 30 km / 19 miles to the north of Kuah, Crocodile Adventureland features many hundreds of crocodiles and alligators, an exhibition centre, plenty of baby crocs and even croc-wrestling. There are two shows a day along with hourly feedings, although it's all a bit contrived and the pools are rather on the small side. Another favourite for holidaying kids is this indoor aquarium, which was opened in 1995 and comes complete with a Plexiglas tunnel and many marine creatures. This attraction is home to thousands of tropical fish, along with sharks and rays, and is purported to be one of the largest of its type in the region. Visitors will enjoy watching the large turtles swimming around, and the entertaining colony of rockhopper penguins, which can be observed swimming underwater. There is also a koi pond, a rainforest walk, a reptile and invertebrate house, Macaw parrots and an adjacent shopping complex, complete with cafe. The Underwater World can be found at Pantai Cenang. Langkawi's Oriental Village is set around a picture-postcard lake and displays the best of Asia, with Asian food, music, games and activities. Hits with the kids include the snake charmer, jugglers, artists and kite flying. There is also elephant riding, as well as many shops and Asian-style houses. The adjacent cable car ride, up the mountain from the village, is extremely popular and therefore does get a bit busy at times. The Durian Perangin Waterfalls are to be found approximately 15 km / 9 miles to the north of Kuah town, being well signposted. Many locals come here to take a dip in the natural swimming pools, which are reached by taking a short walk through the forest and offer a very pleasant way to cool down on a hot day. The actual waterfalls are best seen in the late monsoon season, being at their most spectacular at the end of September and the beginning of October. The village of Air Hangat lies on the northern side of the island, close to the road leading to Tanjung Rhu, and has become famous for its elaborate springs, cascading with natural hot water. Legend says that these springs arrived following a fight between two of the island's most powerful families, which resulted in a pan of hot water landing where the village is today. Apart from a visit to the springs, there is little in the way of attractions in Air Hangat. Visitors may like to check out the gift shops selling Malay handicrafts, or perhaps may be lucky enough to enjoy one of the interesting cultural performances which take place here on a regular basis.